Top 10 Garden Flowers That Require Almost No Maintenance! Sometimes gardening can be a challenging activity. It takes time and effort to master the skills of proper planting and nourishing flowers and plants. You may feel a little discouraged by the fact that some people are able to produce enormous lettuce heads, huge red tomatoes and flowers that create endless blossoms, while your plants do not seem to thrive for some reason. Luckily, there are plants that will reward you with beautiful blooms and healthy foliage even though you do not need to invest a lot of care and effort in their maintenance. Allow us to share with you our selection of 10 low-maintenance, but lovely plants. There are two varieties of coreopsis plants: annual and perennial that also differ in height. Coreopsis resembles daisy and blooms in beautiful hues of bright yellow, white, pink, orange, and ruby-red. It thrives in dry conditions and loves sunshine, so it needs watering occasionally when it is dry. The dark brown spot in the middle of the flower beautifully contrasts the bright color of the petals. It will continue to cheer you up with beautiful blossoms long after other sorts of perennial flowers in your garden have faded out of bloom. Coreopsis is also the official state wildflower of Florida. It requires very little maintenance. In growing season, deadheading, or removing the dead flowers, is recommended so that new flowers can emerge more quickly. Occasional trimming is useful later in the summer season so that new blooms can last. These annual, biennial and perennial flowers are members of the family of carnations. They bloom in beautiful shades of white, pink, salmon and white and have a characteristic oriental clove-like fragrance. They bloom from the months of May to October. Dianthus loves the sunshine and requires a minimum of 6 hours under direct sun. The soil needs to be well-drained and alkaline. It is simple to care for dianthus flowers: water them when dry and fertilize bimonthly. Deadheading is recommended to make room for new blossoms. These are color-changing ornamental flowers that grow on bushes in globe-shaped clusters. It is so amusing to watch how their shade changes from blue in acidic soil, to pink and light purple in soil that contains lime. The color can change to green once the blossoms fade with age. There are varieties that like being in the full sun and those that prefer some shade. Most hydrangeas thrive in rich, well-drained soils. Most common sorts of hydrangea are Lacecaps and Mopheads. All sorts yield beautiful blooms that change color. These attractive succulents are called hens and chicks due to the attractive rosette shape and the feature of the mother plant to create small baby plants. The smaller plants are attached to the mother by an underground runner. They flourish both indoors and outdoors under all conditions. When planted in the garden, the best location for them is dry, nutrient-poor soil. Being succulents, they require a small amount of water. The mother plant can grow to the size of a plate and the chicks can be as little as a dime. This lovely summer flower blooms in big neat clusters whose shades change from monochrome to multicolor. It can be grown in containers or in the garden. It produces flowers for a long period of time, loves the sunny location and needs a well-drained, slightly acidic soil. The planting is in spring and new blooms will appear gradually. With the increase in temperature, lantana will yield abundant bloom, attracting butterflies and hummingbirds. This characteristic annual flower produces blossoms during the whole summer period and into fall. The flowers appear on top of the main stems. 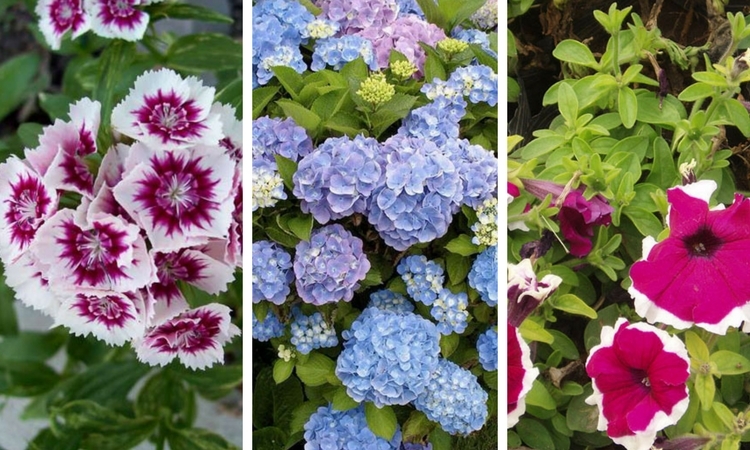 The color varieties are white, blue, light pink, blue and bicolor. Its leaves have an apple-like fragrance. Angelonia can be planted in impressive looking masses or in borders and it can grow in pots and window boxes. It doesn’t need to be deadheaded in order to produce new blossoms. It thrives in full sun six to eight hours a day, so it is heat-resistant and does not require a lot of water. Cutting out the tops of the stems in young plants will improve branching and bushiness. This flower is perfect for busy gardeners and novice gardening enthusiasts. It blooms abundantly in a variety of hues, rewarding you with a splash of color that fills flower beds or big planters. The flowers grow along their stems, achieving the height of 4 feet. The blooms spread almost on a daily basis. Wave petunia loves being in full sun and prefers moist but not soggy soil. It does not require deadheading and it will continue to grow and bloom during all summer. This annual plant will brighten up any unsightly part of your yard with its joyful blooms, in shades that range from lavender to orange. This sort of impatiens flower can tolerate sunshine and heat for more than eight hours a day. It needs to be well watered in hottest days and the soil needs to be kept moist. It thrives in light shade. It looks attractive in planters and hanging baskets. This plant has leaves in remarkable colors that range from green, yellow, pink, red to maroon. They differ in sizes and shapes and add a splash of color to gloomy corners, beds and borders to attract attention and add decoration. Coleus is one of the simplest and fast – growing plants to maintain. It needs fertile and well-drained soil and can tolerate the sun, although it prefers partially shaded places. To encourage bushier growth, it is recommended to pinch the shoots of young plants. It needs to be kept indoors in winter time. . This perennial common flowering herb comes in multiple color varieties. Its leaves are fern-like. It can be planted in flower beds or in a herbal garden, serving a double purpose – as a beautiful addition to your yard and as a herb with amazing medicinal properties. It requires no care at all, thriving in poor dry soil and sunny warm places.